WxOutside integrates with your soil sensor for an accurate forecast. WxOutside can detect irrigation and adjust the forecasts to match reality. Complete the picture with soil temperature forecasting. Use the WxOutside dashboard, or the API for connecting to your existing software. Soil moisture best practices tend to be vague due to the variability of soil across locations. This renders planning of irrigation activities as less of a science and more of a guess, and difficult to prove for compliance purposes. Upcoming weather events can have a significant effect on soil conditions, which may also be further impacted by prior irrigation activities. 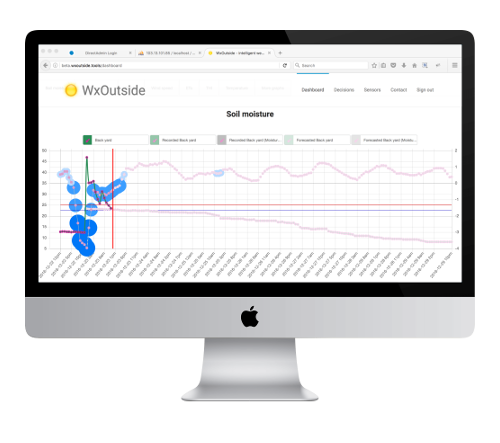 WxOutside can detect irrigation, handle unexpected weather events with ease, identify the field capacity and wilting point, and is accurate to within 99.5% of the final reading. WxOutside takes sensor data and weather forecasts, and models how the soil has responded in the past. Soil behaviour is then converted into a forecast, and returned to the irrigation controller. The irrigation controller then cancels or proceeds with planned irrigation. WxOutside is a complete picture of what has happened, what is happening, and what will happen. With WxOutside, the benefits don't stop with environment monitoring. You also get support and customisation options to ensure you get the maximum benefit from the sensor network. Any sensor can be supported if it provides basic soil telemetry. Your sensor data can be accessed on any device, including mobile phones. Customisable alerting for any environmental conditions.